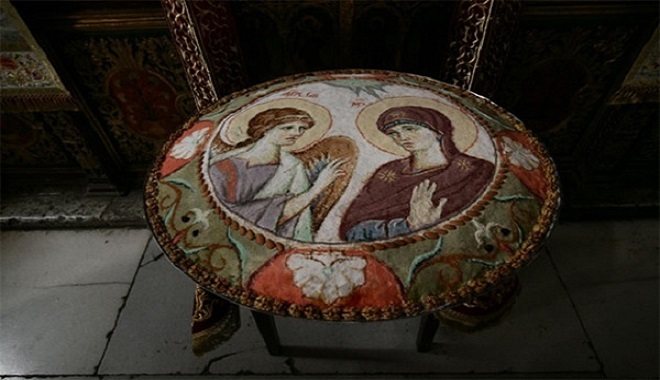 Question 75: Do you think Deaconesses should be restored in the Orthodox Church? Answer: If it is done for the sake of tradition, then I could maybe be convinced, but if it is done for the sake of progress, then I probably will not be on board. I've been to some female monasteries where there is usually a nun who performs some of the liturgical duties of a deaconess, although she is not one, so if it will be restored, this may be a good place to start, especially if the priest who serves in such monasteries is older and alone and needs the extra help. I should add that Deaconesses have functioned in modern times on occasion, as the need arose, so there really should not be talk about restoring it, but instead if it is necessary. Question 76: Lately I’ve started reading a little about Joan of Arc. She seems to have been somewhat “Orthodox" compared to the English-leaning church officials who condemned and martyred her. I have read a few of her responses during her trial and they seemed enlightened despite her being uneducated. What do you think our church stand is regarding her holiness? Answer: The short answer is that the Orthodox Church does not have a position on Joan of Arc, since she lived in the 15th century and was not part of the Orthodox Church. It is furthermore difficult to even form a judgment about her, since her faith that we know of and prominence were based on visions she saw, whether one considers them divine or not. Analysis of her visions is problematic since the main source of information on this topic is the condemnation trial transcript in which she defied customary courtroom procedure about a witness oath and specifically refused to answer every question about her visions. She complained that a standard witness oath would conflict with an oath she had previously sworn to maintain confidentiality about meetings with her king. It remains unknown to what extent the surviving record may represent the fabrications of corrupt court officials or her own possible fabrications to protect state secrets. To me she is an interesting historical figure and no doubt a French national hero, but I would not call her Orthodox, and the truth of the matter is that very little that is reliable is known about her. Question 77: Does the language matter on an icon, or an Icon speaks on it own? Is the writing necessary? If yes does it have to be in English and Greek in America? In our parish we have wonderful iconography done by Pachomaioi of Mount Athos and the writing is in Greek. Pantocrator, Platytera, the four Apostles were done so far. Now the priest wants to continue to do the rest of the church but he wants the rest of it to be done in Greek and English. The majority of the parishioners do not agree but he is pushing through - His reasoning is to accommodate non-Greek speakers. Any thoughts? Answer: No, the language does not matter. Personally, in America I believe the writing should be in English, and I would say also that the native language of the country the church is in should be used. Greek is fine, but the future of Greek parishes in America is not Greek, but English. I would further say that I do not like two languages on an icon; this is unnecessary. Question 78: What are the origins of Kollyva? I read somewhere that it has a Christian origin, while elsewhere I read it had a pagan origin. Answer: Many Orthodox claim that the origin of Kollyva was with the miracle of St. Theodore in the fourth century during the reign of Emperor Julian the Apostate. But in the Synaxarion for the First Saturday of Great Lent, when this miracle is commemorated, we read that in a vision St. Theodore informed Archbishop Eudoxios to make the kollyva in the manner it was being made in his hometown of Euchaita. This tells us that kollyva pre-existed the vision of St. Theodore, and we in fact know that something like kollyva was being used in ancient Greece. I can't say it necessarily has a pagan origin, but the origin does date to ancient Greece when paganism was the dominant religion. Question 79: There is a small movement in Protestant New Testament scholarship to revitalize Koine Greek as a Lingua Franca among Christians (scholars and lay intellectuals). Randall Buth, who is sort of a figure head of the movement, uses a proverb to make a point. A Rabbi in Russia can communicate with a Rabbi in Argentina in Rabbinic Hebrew. A Muslim scholar in Indonesia can communicate with a Muslim scholar in Egypt in Quranic Arabic. So why do not Christians have the ability to communicate in the language of their sacred texts. Well Judaism and Islam have made a commitment to preserve the use of their sacred tongues. Buth heads up a language school in Israel that teaches Koine Greek and Biblical Hebrew by teaching the class in the respective language. Here is an explanation of the value of such an approach as given by him: http://lists.ibiblio.org/pipermail/b-greek/2009-March/048787.html. I have been debating whether to throw my hat in with this movement.Your thoughts? Answer: That's a good question that I have contemplated as well. Here are my brief thoughts on the subject. As far as the movement within Protestantism is concerned, the question that must be asked is what the purpose of this whole movement is. Will the original language alone help ones understanding of Scripture? I think it could help, but it is also misleading in many ways. For example, I once had a professor in Old Testament who taught some fringe things about the subject, but no student was allowed to question him unless the student knew Arabic or Hebrew. Language is a lot like logic in the sense that they both can be manipulated to justify just about anything. From an Orthodox perspective however, keeping in mind that the Orthodox preserve this understanding of the original language of Scripture, the key to understanding Scripture is not the language alone but the entire living tradition of the Church. If you read Becoming Orthodox by Peter Gillquist about his conversion to Orthodoxy from Evangelical Christianity, the one thing that struck me was the fact that his study of New Testament Greek did not necessarily bring him to an understanding of the truths of Scripture, but it confirmed for him that the knowledge of the original language of Scripture confirms the living tradition of the Church as the framework through which Scripture can be understood. If the living tradition of the Church is the framework through which understanding of Scripture comes, then language of Scripture becomes unnecessary though helpful. This is why Sts. Cyril and Methodios had such great success evangelizing the Slavs and Sts. Herman and Innocent the Aleuts among many examples. They did not impose a common Lingua Franca like the Papal Missionaries did. It's the idea of a common Lingua Franca that led to a Protestant Reformation in the first place, among other things. By translating the Scriptures in the language of the "barbarians", the Saints mentioned above were better able to teach them the living tradition of the Church which would guide their understanding of Scripture and gave them greater potential to reach theosis.